Abstract - The application of mobile technology in agriculture is expanding rapidly, with new devices and applications being available for everyday use. However, the absence of seamless architecture required to integrate mobile devices with server has limited its use. Ideally this kind of architecture would enhance mining and dissemination of expert information to reach farmers on time. Consequently, farmers can hardly set prices and market their sugarcane products on time hence low income characterized by widespread poverty and low living standards. Although mobile data mining has been applied in other sectors of the economy such as transport and stock market, its application in agriculture is still wanting. There is therefore a need to upscale service oriented mobile data mining techniques to improve discovery and dissemination of agricultural market access knowledge. The objectives of this study were to: (i) examine existing architectures for m-mining agricultural resources; and (ii) evaluate their challenges using scenario and experienced based methods. Results showed the existence of predominantly manual system which was limited by various socio-economic and technological challenges including, inconsistency, error prone, poor internet connectivity. The results also showed that the choice of market for sugarcane greatly depended on the price and mode of payment. The study adopted service oriented architecture as the guiding model. The study recommended integration of mobile phones (SMS technology) as suitable architecture for m-mining and dissemination of market access information. Abstract - The ever-increasing traffic demands have motivated mobile operators to explore, how they can boost their network capacity with a minimal increase in their capital and operating expenditures. In order to solve this problem, energy-efficient design of 4G/LTE-A system is discussed, especially with a focus on deployment architecture. One of the strategies to solve this problem is the use of already available licensed spectrum without affecting the communication of primary users. As it is proven by Shannon that Energy efficiency is increased by improving the Spectrum efficiency. In our study we focus on improving the spectral efficiency. For this purpose we use the concept of Cognitive Network cooperation. This is the combination of cognitive radio and network cooperation. Cognitive radios are exciting emerging technologies that have the potential of dealing with the demanding requirements and scarcity of the radio spectrum. 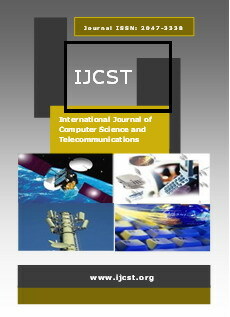 Cooperative communication and networking is another new communication technology paradigm that allows distributed terminal in a wireless network to collaborate through some distributed transmission or signal processing so as to realize a new form of space diversity to combat the detrimental effects of fading channels. To resolve this issue of spectrum scarcity and power consumption we use cognitive radio which has tremendous capabilities of spectrum sensing and communicating on unlicensed spectrum, with the combination of network cooperation. Abstract - Future Internet traffic will be huge both for real time and non-real time traffic in an IP mobility environment due to proliferation of mobile nodes. MIPv4 is one of IETF defined IP mobility protocols but with QoS issues like end-to-end delay due to triangular routing, jitter and throughput. OPNET Modeler 14.5 was used in this research to simulate MIPv4 based WiMAX network combining MPLS and Diffserv to improve upon the service quality of the network. The end-to-end delay for 20 mobile nodes (MN) was reduced considerably to less than 0.09 second for VoIP traffic and 0.7 second for video conferencing. Jitter was virtually eliminated and good improvement on service throughput. With this improvement in MIPv4 network performance, it can be integrated with MIPv6 network for better future Internet service delivery. Abstract - The advance innovation through which various facilities, such as, access of information, storage of information, applications and platforms can be accomplished by web is called Cloud Computing. While moving expansive amount of information and data on the cloud, it is vital to guarantee suitable security control. User authentication is a main technology for data security, which is a technique to establish proof of identities to get access of data and information in the system. Traditional password authentication does not offer adequate security for data in cloud computing environment. In this research work, we will try to develop and introduce a trusted customizable authentication security framework for cloud environments which improve security. This research work will propose mechanism of multi factor for secure user authentication. There are many technologies for multi-factor authentication and client preferred one method to another. In this research work, we will let the client to choice their preferred factor through Customizable Client Authentication Framework (CCAF) for authentication along with username and password. Based on the clients’ requirements, they have to select the preferred type for authentication service. The model will consist of four stages such as Registration stage, Login and authentication stage, Forget authentication credential stage and Change authentication credential stage. By implementing CCAF model will improve the rate of trust and reliability in cloud computing environments as an evolving and influential technology in various industries. Abstract - The study presents in this paper detects the disease of fish which is EUS (Epizootic ulcerative syndrome) through the two feature descriptor. EUS (Epizootic ulcerative syndrome) disease is still misidentified by the people and it is caused due to fungus which is Aphanomyces invadans. Correct diagnose and prévention of disease is very necessary for the growth of the nation as fish is a food of millions of people. To extract the feature and to achieve the fast and accurate region of interest (ROI) of EUS infected fish through FAST (Features from Accelerated Segment Test) and HOG (Histograms of Oriented Gradients) Feature Descriptor. The Experimentation done on real images of EUS infected fish in MATLAB environment.